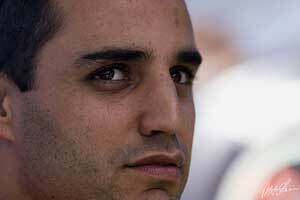 The son of an architect who had raced karts, Montoya began driving karts when he was only five years old. He started racing at 10 and when he was 16 traveled to Italy to race in the World Championship. That year he won the Bogota Six Hours sportscar race at the wheel of a Group C Spice. He went attended the Skip Barber Racing School in the United States and then returned to Colombia and won four of the eight races in the local Copa Formula Renault. In 1993 he raced a Swift and scored seven wins and won the title. This led to a move to the Barber Dodge Championship in the United States in 1994 and he finished third in the series with two victories, while also competing in races in Mexico when he had time. In 1995 he moved to Britain to compete in the Formula Vauxhall Championship in which he scored four wins and finished third in the series. He moved into British Formula 3 in 1996 with Richard Dutton's Fortec team and driving an unusual Dallara-Mitsubishi scored two wins and finished fourth in the championship. That year he also raced in the ITC series with Mercedes-Benz. In 1997 he moved up to Formula 3000 with the RSM Marko team in 1997 and he won three races and finished second in the series to Ricardo Zonta. At the end of the year he was signed up as a test driver for the Williams team, agreeing to give the team first option on his services in F1 for five years. In 1998 he switched the Super Nova team in Formula 3000 and won the title with four victories. He also completed 5000 miles of testing with Williams. With Williams signing up Alex Zanardi and Ralf Schumacher for the 1999 season there was no room in the F1 team for Montoya and so a deal was struck for him to go to America for two years to replace Zanardi in the Target Chip Ganassi Racing team. He took the championship by storm, winning the CART title at his first attempt with seven victories. The team then switched to Toyota power and in the spring of 2000 Montoya gave Toyota its first CART victory in Milwaukee. The same year he competed in the Indianapolis 500 in a Ganassi-run IRL car and won the race at his first attempt. In 2001 he moved to Europe to be Ralf Schumacher's team mate at Williams and at the end of the year he won his first victory at the Italian GP. The 2002 season was a frustrating one with a string of pole positions but no victories and Montoya went into 2003 hungry for more big results. He should have won the world title that year but made a couple of costly mistakes and fell out with the team and signed for McLaren for 2005 before he had even started racing in 2004. That season was unspectacular apart from a victory at the end of the year in Brazil. He moved to McLaren but missed several races after damaging a shoulder and so dropped behind team mate Kimi Raikkonen. In the end he won three races and finished fourth in the World Championship. In 2006 he was rarely a match for Raikkonen and when it became clear that he would not be retained in 2007 he decided to sign a deal to race in NASCAR. It was then agreed that there was little point going on at McLaren and he handed the drive over to Pedro de la Rosa.